Unleash a world of open-ended creativity and imagination with the LEGO Classic creative Builder box. Imaginative building play is easy with these bright, colorful versatile LEGO bricks, including a wide selection of doors and windows, shapes and special elements for creating all kinds of buildings. This set provides 3 levels of building complexity and includes an inspirational guide to help your child discover their creative building skills. 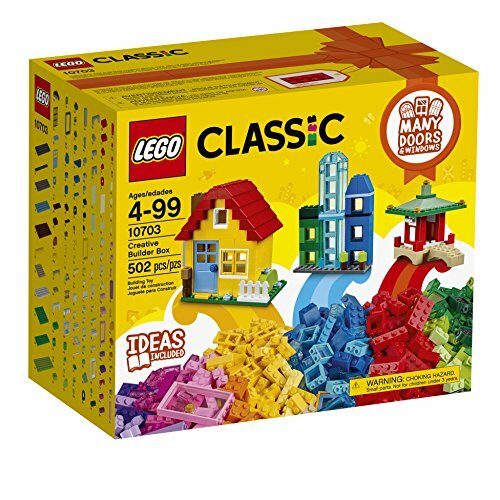 Features a mix of classic LEGO bricks, including a wide selection of doors and windows plus shapes and special elements for creating all kinds of buildings. This LEGO Classic Creative Builder Box set allows for open-ended creativity and imagination. Provides 3 levels of building complexity to suit builders on different levels. Includes over 500 pieces in a rainbow of fun, bright colors that encourages open-ended creativity. This set offers an age-appropriate build and play experience for ages 4-99.